Norristown, Pa. November 2016 – Megger has enhanced its series of insulation and continuity testers, making testing faster and more convenient, as well as minimizing the risk of accidental damage to equipment under test. Designed specifically for the telecommunications and cable testing markets, the MIT480/2 series features a three-wire connection for A, B and E (tip, ring and ground), eliminating the need to connect and disconnect leads to carry out the full range of testing on a cable pair. 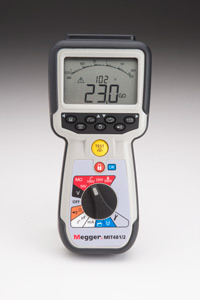 The series includes two models, the MIT481/2 and the MIT485/2, both with a safety rating of CAT IV 600 V. The MIT481/2 offers a choice of four fixed test voltages and result storage, while the MIT485/2 includes a variable test voltage feature, support for downloading of test results via Bluetooth wireless connection and offers a feature for recharging batteries without removing them from the instrument. Both units are in compliance with IEC 61010. The MIT481/2 offers fixed test voltages of 50 V, 100 V, 250 V and 500 V dc and a variable test voltage range from 50 V to 1,000 V. Selection of the 500 V fixed test voltage is gated to guard against accidental application of high voltage to sensitive equipment. The MIT480/2 series delivers accurate results up to 100 GΩ. The feedback-controlled insulation test voltage is accurate to +2%, providing more accurate test voltage without the risk of over-voltage damage to circuits. This new series also offers fast continuity testing with a user-selectable test current of 20 mA or 200 mA. Continuity testing covers 0.01 Ω to 1 MΩ without the need for manual range switching. A differential test feature allows the difference between the two consecutive continuity measurements to be calculated and displayed automatically. Both testers provide DC and true rms AC voltage measurements up to 600 V. When measuring AC voltages, frequency up to 450 Hz is displayed simultaneously. They offer plenty of on-board storage for test results. These enhanced insulation testers feature a tough housing with shock-absorbing rubber over moulding. Both units are ‘weatherproof’, eliminating the possibility of water ingress into any part of the unit including the batter and fuse compartments.